Moped 1982 Piaggio “Ciao PX” or simply “Ciao” was highly popular in Italy and brothers Marco and Mario from Italy’s from OMT Garage decided to take it as a base for their small cafe racer. And they’ve won the “Deus Bike Build Off 2016” with their new Piaggio Ciao “Silhouette” in the category 50/125 sm3. The brothers completely modified the tiny two-stroke engine, boosting its capacity to 75 cc, from the factory’s 49 cc. They also added an electronic ignition, a 19 mm carburetor, a hand-made exhaust, plus a lightened flywheel. 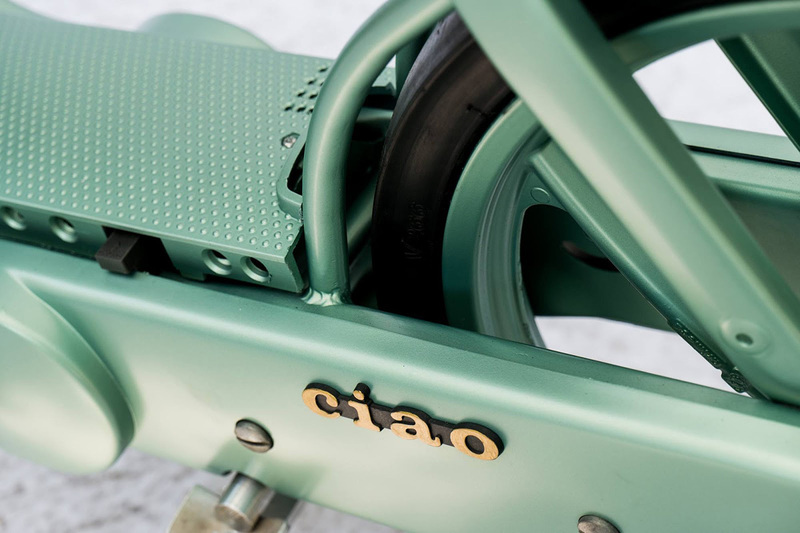 With the front brake now removed from the original “Ciao”, only the rear brake stops the rider after crossing the finish line. It’s activated with the left-hand lever, while the lever on the right-hand-side manages the moped’s throttle.